industrious justice: 2014 Goal Updates! My 4th 5K & a Recipe Roundup! *My full list of 2014 goals can be found below. 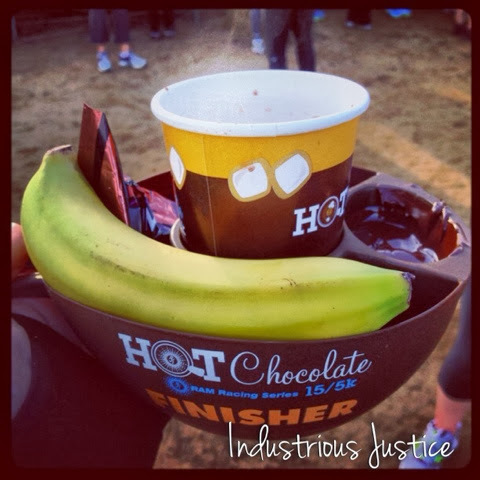 2014 5K #1: Sunday, January 12 -- Hot Chocolate 5K. This was a fun one, although very crowded. So crowded that I couldn't run at the pace I wanted until at least the Mile 1 marker. There were a few spots in the beginning where I was trying to run but realized that I could walk faster than the people "running" in front of us. (Really, they were just bouncing slowly along with the crowd...) What is it with people walking four- or five-wide across a narrow path, sidewalk, etc? (This annoyance obviously extends beyond this event.) Shouldn't this be like driving? Slower people to the right, faster people to the left...right?? Sorry for the mini-rant but I needed to get that off my chest. I feel better now. Now on to the good stuff! 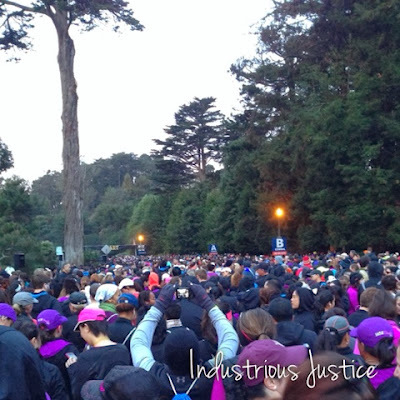 This run was in Golden Gate Park in San Francisco (like the Awesome 80s 5K) and although it was really cold at 7:30 am...it was a gorgeous day and Golden Gate Park is an incredibly beautiful place to be, running or otherwise. I ran this 5K with my honey (it was his first! ), my friend from my first 5K in July and my friend from the Awesome 80s 5K in November. We were a good team and all finished within a couple minutes of each other. My final time was 38:19. Not my fastest (that was the Temecula 5K) but over two minutes faster than my last 5K in November. Not too shabby, seeing as I didn't run much prior to this one. The especially cool thing about the Hot Chocolate 5K is that they give you hot chocolate (hence the name) AND fondue at the end. The chocolate was surprisingly good and I thoroughly enjoyed it with the dippers they provided -- a banana, marshmallow, rice crispy treat and a wafer cookie. It was all served up in this cute finisher's mug. In addition to running a 5K, we walked 3-miles roundtrip to and from the event from our friend's home and another few miles to and from brunch. We have established a nice 5K + Brunch tradition and I am loving it. 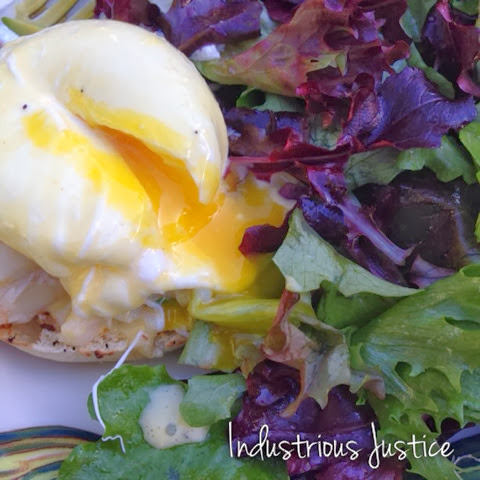 Here's a photo of what I stuffed in my face that day -- fresh crab, avocado and a perfectly poached egg on an english muffin with salad on the side. Spaghetti Squash Primavera from Skinny Taste -- I may have used a little extra cheese. Healthy and delicious. I highly recommend this one and you can make the spaghetti squash the day before for an even faster dinner. Mom's* Creamy Chicken and Broccoli Casserole from Cooking Light -- Our milk had gone bad (whoops) so I subbed low sodium chicken stock. I also added a bit more liquid and stirred in 2 cups of cooked brown rice and heated it all together before pouring it into a baking dish, topping with cheese and broiling. I just had the last of the leftovers for lunch today. I really liked this one but my honey didn't really care for it. I don't think he likes the "just chicken" from Trader Joe's. He thinks it tastes too processed. I think I will try this recipe again, but with rotisserie chicken. Balsamic & Bacon Brussels Sprouts. Recipe from a friend. -- The combination of ingredients in this dish is incredible. We ate it as a side dish with bun-less burgers topped with a little gruyere cheese. I will be making it again soon to fine tune a few things and then I will post the recipe here. Stay tuned!